The route takes me north of downtown. Here is the skyline from the Quitman St. Bridge. That's I45N coming at ya'. The route goes all the way across downtown. Getting through downtown on an early Saturday isn't too bad. Helps to time the lights right. Went south to Hermann Park. I've never understood this feature. It's a straight ripoff of the Mall in DC. Complete with a minature Washington Monument. Is it supposed to be? Or is just completely unoriginal? 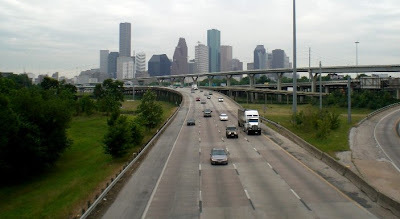 Anyway, from there, I went back northbound back to downtown and across Allen Parkway. I went all the way up to 43rd street and headed back east...43rd turns into Crosstimbers which is the home of Flying Saucer Pie Company. The pies from this place are YUM! After a winding trip down Fulton to Airline it was time to take a break and get a bite to eat at the Spanish Flowers Restaurante'. Yum! Then it was the short two-block trip back home! Nice route. Don't think it would be too good on a week day, but for a weekend ride, it's perfect.